The Slate is now an unprecedented 2-in-1! Thanks to our new Graphic Tablet feature, you can now use the Slate directly into your favorite drawing softwares (As Adobe, Gimp, Corel Draw and many more) on your PC or Mac. The Slate handles every stage of the creative process. Begin outlining your ideas on paper with the Slate in Imagink and export your creation to your computer. Then finish your work with Adobe’s creative suite using the Tip (iskn’s stylus) and the Slate in graphic tablet mode. To turn the Slate into a graphics tablet and use it on your favourite desktop drawing apps, we provide the so called graphic tablet configurator. A configurator is a medium that allows you to set the preferences of your Slate. Once you have installed and configurated it, the settings will be saved automatically and are applied to your computer automatically. In case you want to change them, just open the configurator tool. 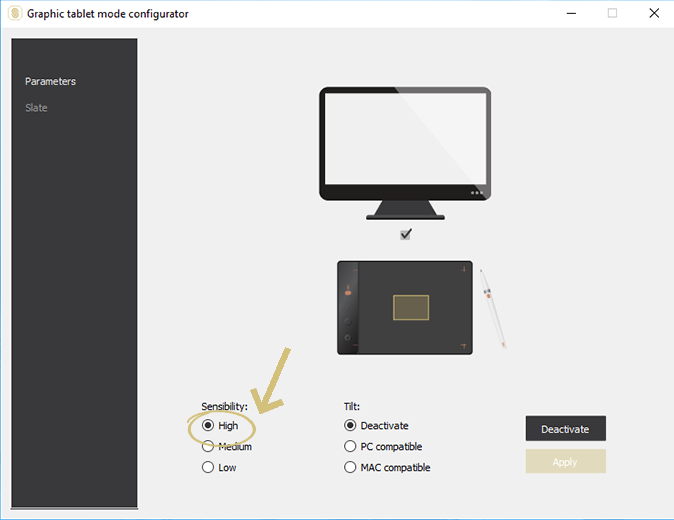 Download (on macOS or Windows) and install the Graphic Tablet Configurator from our download page (in case you cannot find the symbol, have a look at this article). Launch the Configurator tool (in case you cannot find the symbol, have a look at this article). 3. Connect your Slate to your PC or Mac using the USB cable and turn on your Slate by making a long press on the lateral Power button. Your Slate will be connected to the Configurator. 4. Into the Parameters menu, set the angles parameters according to your operating system and click on the Activate button. The recognition of tilt varies between PC and MacBook. 5. Your Slate is now ready to be used as a graphics tablet into your favorite apps. Enjoy this mode using the Tip over your Slate surface for a better experience. 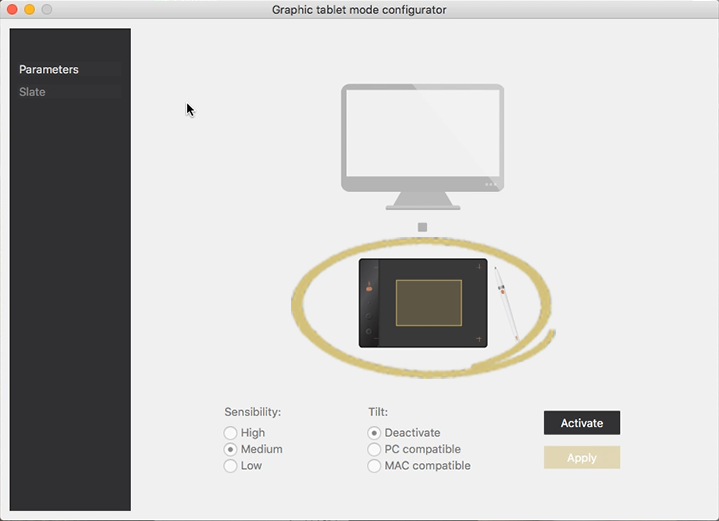 In case you want to use the Slate as a graphic tablet on Imagink, make sure that you disconnect the Slate from Imagink and connect it to the graphic tablet mode. 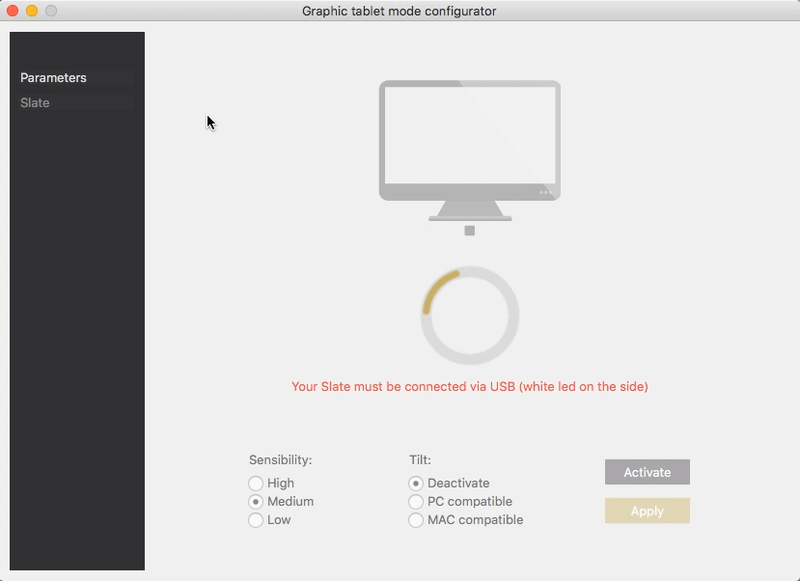 To do so, desactivate and reactivate the Slate in the configurator window. In case you should have troubles to download the graphic tablet configurator or to connect your Slate to it, please contact our customer service via the little golden widget bottom right. Find the whole video above here (3rd episode)!